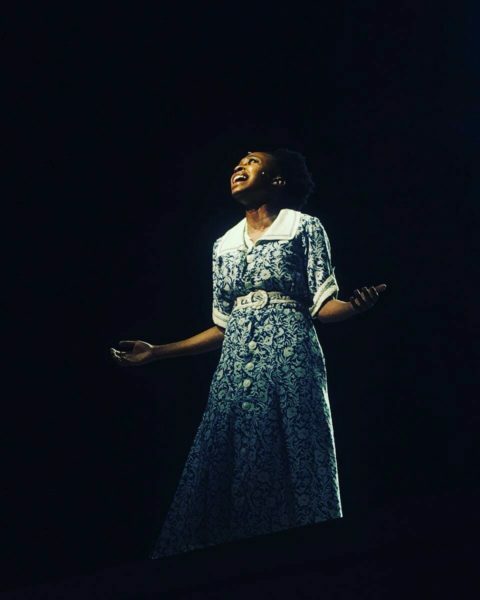 Former Witsie Didintle Khunou’s (25) career has hit a high note with one of her biggest performance gigs in the musical, The Color Purple. The BA Dramatic Arts graduate plays the lead role, Celie, which was played by Whoopi Goldberg in the film adaptation. She also has a role on the popular SABC 2 Sesotho drama series, Mamello. Wits Vuvuzela caught up with Khunou to find out about her experience and journey in The Color Purple. The production opened on January 31 and runs until March 4 at the Joburg Theatre. How do you achieve such vocal strength? The vocal strength comes with a lot of sleep (she laughs) and training. Before I started with The Color Purple I ensured that I went to practice with a vocal coach and with Rowan Bakker who was also the musical director of The Color Purple. I honestly think that without that training, I wouldn’t have been able to hit the notes that I can. Both the high notes and the low notes. How did you receive the news that you had made it into The Color Purple? I was very shocked because I am a newcomer to the theatre industry. I mean I have done more television and film work than I have theatre. I am not necessarily a professional singer, and I remember having watched Cynthia Erivo who played Celie in the Broadway revival and thinking “Okay, well, if this is the level that I have to sort of match up to, maybe I might not make the cut,” but I did and when I got the news I was ecstatic, I called my mum first and told her and then I called my acting coach Steven who has played an important role in helping me prepare for the auditions. Were you hoping to get the role of Celie when you auditioned? No! In fact, I was thinking of auditioning way in advance. I think it was 2016 when they were having their open call auditions in Pretoria, but I was shooting for a TV series called Mamello, a Sotho drama and the shooting schedule just clashed with mine. I realised that there was no way that I could leave set and I just let go of the idea of auditioning. Then I get a WhatsApp from my best friend who sends me this brief, much quicker than my agent could (she laughs). She’s like “Oh my God! They’re still looking for people for The Color Purple. You need to go; this is a sign!” The intention was just to go to be a part of the production. I didn’t care if I was going to get Celie or if I was going to get any other character. It’s been a very challenging one. Challenging in understanding the character, and embodying the character in a way that is true to me. And because there are so many similarities in terms of Celie’s belief system and one that I used to inhabit as a younger girl growing up and also in varsity. I realised that having to embody Celie meant having to dig up some of my own personal wounds. So, emotionally it was quite challenging because I had to do a lot of confrontation. At the end of the day after having to confront all of those aspects of myself that I could bring to the table in inhabiting Celie, I ended up feeling very healed and still to this day every time I get on stage and I perform I feel a lot of healing taking place. What have been some responses from audience members that have inspired you? We’ve been so lucky to have really good reviews and only good comments and remarks from people who have come to watch the show. People also keep saying that they want to come back again. That is really humbling to hear because it makes me feel as though we are successfully carrying the intention of Alice Walker through the story. My biggest goal was to make sure that her core messages are being read through the show and it seems as though we are doing it well. A lot of people have questioned that I’d be able to do it because I’m quite young,ut people believe in how I manage to age Celie throughout the show. Night after night we get standing ovations and it’s because the story is incredibly powerful and that’s why people walk away so inspired. It really shows a powerful and positive representation of black women and right now, South African audiences seriously need to see that. Who is your favourite character in The Color Purple? I love them all because they all serve such an interesting purpose to the story. There’s Harpo. His role helps men challenge their own masculinity. His character makes us look at how men because of patriarchy are forced to perform masculinity and how it hurts them as well as women. Then there’s Mister, who lives his entire life being a replica of his father who we realise also abused Mister. Then there’s Sofia who is this hard rock character. She puts herself in a position where she lets her voice be heard. Her biggest number is ‘Hell No’ in the musical and that is just a song that speaks back to how you cannot allow yourself to continue playing the victim. You have to be a victor of your situations. How do you make the transition from TV performance to theatre? I’m trained in theatre performance, so I understand that theatre is different from TV in terms of the energy that you embody. You have to make sure that all of you is reaching out and touching all of the audience in the theatre. With theatre you want to create an experience for people.